The sun-like star, PZ Tel A and its brown dwarf companion, PZ Tel B. For size comparison, the size of Neptune's orbit is shown; PZ Tel B is one of few brown dwarfs imaged at a distance closer than 30 Astronomical Units from its parent star. A raresun-like star that is both young and relatively close to Earth has been foundto be harboring an even weirder object ? a failed star locked in a close orbitaround its host, according to a new study. "BecausePZ Tel A is a rare star being both close and very young, it had been imagedseveral times in the past," said research team member Laird Close, a Universityof Arizona professor at Steward Observatory. "So we were quite surprisedto see a new companion around what was thought to be a single star." Aninternational team of astronomers, led by Beth Biller and Michael Liu of theUniversity of Hawaii, made the rare find using the Near-Infrared CoronagraphicImager (NICI), on the international 8-meter Gemini-South Telescope in Chile. Thebrown dwarf is about 36 times the mass of Jupiter, they found. 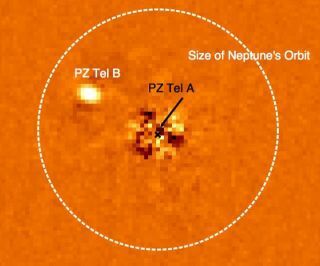 Thehost star PZ Tel A is essentially a younger version of the sun, but while ithas a similar mass, it is much younger, at only 12 million years of age (about400 times younger than the sun). The star is located approximately 168light-years away from the sun. Thetwo objects are separated by only 18 astronomical units (AU). One astronomicalunit is the average distance between the Earth and the sun, which isapproximately 93 million miles (about 150 million km). Inthe study, Close reanalyzed images of the parent star from 2003, in which thestar's glare obscured the presence of the brown dwarf. That suggests its orbitis more elliptical, rather than circular, researchers said. Browndwarfs are odd objects that fallsomewhere between planets and stars because of their temperature and mass. Theyare cooler and lighter than stars, but more massive ? and typically hotter - thanplanets. Mostyoung brown dwarfs and their companions found by direct imaging are at orbitalseparations of greater than 50 AUs (about 4.6 billion miles). For comparison,Pluto's highly elliptical orbit ranges between 30 AU (2.7 billion miles) at itsclosest to 49 AU (4.5 billion miles) at its most distant, according to a NASAfact sheet. Sothe relatively small 18 AU (1.6 billion miles) separation between the browndwarf PZ Tel B and its partner is striking, researchers said. The astronomers alsoobserved PZ Tel B moving quickly outward from its host star in a non-circularorbital path. "PZTel B travels on a particularly eccentricorbit ? in the last 10 years, we haveliterally watched it careen through its inner solar system," said BethBiller, lead author of the study. "This can best be explained by a highlyeccentric, or oval-shaped, orbit." ThePZ Tel system is young enough to still possess significant amounts of coldcircumstellar dust, which may have been sculpted by the gravitationalinteraction with the young brown dwarf companion.? Assuch, the odd binary object system can serve as a laboratory that can helpastronomers study the early stages of solarsystem formation, researchers said. Thebrown dwarf's mass and orbital motion have significant implications for whattype of planets can form ? if at all ? in the PZ Tel star system. Thenewfound brown dwarf was discovered using NICI, which is the most powerfulhigh-contrast instrument designed for imaging brown dwarfs and alienplanets around other stars. NICI iscapable of detecting companions 1 million times fainter than the host star, atjust one arcsecond separations. Sincethe brown dwarf is so close to its parent star, special techniques were neededin order to distinguish the faint light of the companion from the light of theprimary star. PZ Tel B is separated by 0.33 arcseconds ? an angular measurementequal to 1/60 of a degree ? from PZ Tel B. This is equivalent to a dime that isseen at a distance of 7 miles (11 km). Theresearch team was able to take pictures so close to the star by using anadaptive optics system and coronagraph to block our excess starlight. They thenapplied specialized analysis techniques to the images to detect PZ Tel B andmeasure its orbital motion. Aninternational team of researchers is currently carrying out a 300-star surveyusing NICI, which will be the largest high-contrast imaging survey conducted todate. "Weare just beginning to glean the many configurations of solar systems around starslike the sun," said Michael Liu, NICI campaign leader. "The uniquecapabilities of NICI provide us with a powerful tool for studying theirconstituents using direct imaging." Thedetails of the PZ Tel B discovery are described in a paper being published bythe Astrophysical Journal Letters.